The Mylo Soft Bi-Color LED 2-Point Light Kit from ikan combines two Mylo Soft LED lights with stands and bags to provide a versatile lighting setup that can be used in a studio or taken on the road. Each light comes with a yoke and barndoors, and is paired with Sony L-series batteries and a dual battery charger to provide portable DC power in venues where you cannot access an outlet. Compact stands are used to support the lights, with two bags included to separately transport the lights and the stands. The Mylo Soft Bi-Color Half x 1 Field LED Light from ikan is a compact 19 x 13 x 3.5" panel with color temperature that's variable from 3200 to 5600K or anywhere in between to match other fixtures or ambient light conditions. The light is fully dimmable; color and light intensity adjustments are made via a simple intuitive knob. The fixture gets its name from the 1/2 stop diffusion panel that's installed to take the edge off the LEDs' illumination and provide a soft, flattering quality of light with the incandescent equivalent of a 450W flood. The Mylo Soft Bi-Color Half x 1 has a 110-degree beam angle for wide coverage that can be controlled or tweaked with the high-output, textured silver 4-way barndoors. The light ships with a 100-240 VAC power supply for worldwide use. For image makers who shoot far afield without access to mains current, ikan includes 2 NP-F750L batteries and a dual charger to power them. The Compact Light Stand Version 3 from Ikan is a space-saving support that rises to a height of 74" and, thanks to a clever reverse folding leg design, folds down to just 21" in length. The matte black stand boasts extra long legs that ensure it doesn't tip over easily, as well as a 5/8" top stud. 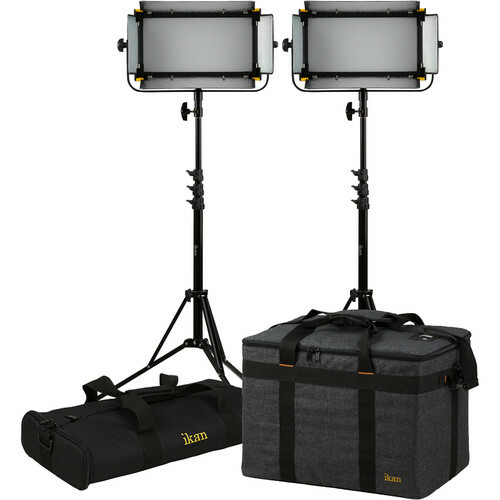 The ikan IBG-1000-3L Light Kit Bag features a mesh pocket for included accessories and adequately fits 3 ID1000 lights and the adjustable padded inserts can be configured to fit the video professional’s needs. Its strong, durable nylon design protects and secures each individual light in the bag and keeps them scratch free. This bag is equipped with dual zippers and a snap-on strap for added security. Also, the IBG-1000-3L bag’s non-skid rubber feet provide a stable foundation for the lights. The plastic-padded side handles and heavy-duty padded shoulder strap provide multiple transportation options for one’s convenience. Store, protect, and transport up to three compact stands or other gear, with the black ikan Compact Stand Bag from Tilta. The bag is designed to be compatible with CP-STND and CP-STND-V3 stands, among others. This nylon-constructed bag features zipper closure and dual, connecting, top strap handles. Rings at either end of the bag provide attachment points for an optional, user-supplied shoulder strap. Non-skid rubber feet help keep the bag stationary. Box Dimensions (LxWxH) 21.3 x 17.9 x 5.9"
Box Dimensions (LxWxH) 23.75 x 3.5 x 3.5"
Box Dimensions (LxWxH) 21.0 x 17.0 x 7.0"
Box Dimensions (LxWxH) 26.0 x 15.0 x 1.5"